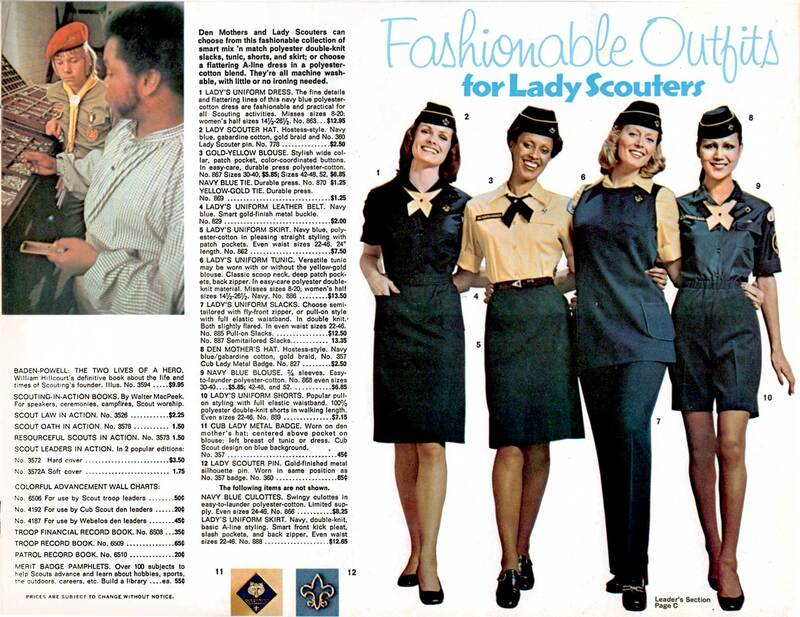 In light of the Boy Scouts’ recent decision to go “gender-neutral” and begin accepting girls, this page from the official 1975-1976 Scouting uniforms and equipment catalog is an interesting earlier snapshot of the role of females in the organization. “Den Mothers” and “Lady Scouters” were/are the female versions of Scoutmasters. The photographer who shot this pose must have previously taken pictures of flight attendants, as this has that arm-in-arm quality of 1960s advertising photos of stewardesses. The skirts and caps look almost as much like airline uniforms as Scouts’. The unavoidable sexism of the era is really reflected in the priorities written into the headline…the women’s outfits are “Fashionable.” In contrast, the previous page, which features men’s outfits, features a headline proclaiming “Your Uniform Tells Everybody You’re a Leader!” No need for men to be fashionable. Well, at least African-Americans are portrayed in both men and women’s pictures. That’s something, anyway.